This week sees the release of spellbook filters for desktop as well as some Bounty Hunter integrity changes. Ever since 2013, players have been proposing that we add filters to the spellbook like RuneScape had around 2011, allowing them to hide/show different categories of spell. Following the recent major spell infrastructure rewrite. we’re now able to add this to the desktop game. Following the results of the recent poll, spell icons will not resize when filters are applied as they do on mobile. As we continue to prepare for the larger scale Bounty Hunter rework, some overall Minigame integrity improvements as detailed in this blog have been made. To be able to receive a Mysterious emblem by killing your target, or as a drop from any player that is risking a Mysterious emblem, you must have one in your inventory. Killing any opponent without an emblem in your inventory will cause any emblems in the opponent's inventory to be lost. Mysterious emblems now have a seven second timer before being destroyed. This is to prevent players destroying them mid combat to spite their opponents. Players may now only skip their targets if they haven't been in combat with them within the last 15 seconds. Players may now skip their target for free and without adding to their "total targets skipped" if their current target is unskulled. Players may now skip their target for free and without adding to their "total targets skipped" if their current target does not have a Mysterious emblem in their inventory. These changes are intended to ensure players can find targets with a similar level of wealth risked without getting stuck waiting to be able to skip another target. The 2 minute timer that ticks down whenever a player leaves the Wilderness with a Bounty Hunter target will continue to tick down for an extra six seconds whenever the player re-enters the wilderness. This change should reduce players' ability to grief their target by making them wait for their target to be lost or skipped. The overlay shown in the Wilderness in Bounty Hunter worlds can now be minimized by clicking on the arrow button on the bottom left of the overlay. On desktop only, it can be moved to the left/middle/right side of your screen by right clicking on the same arrow. To re-open the overlay simply click on the arrow again. 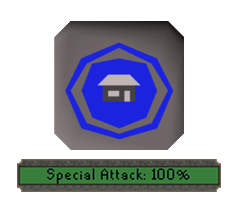 Players may no longer teleport for a few seconds after using a special attack in PvP combat on PvP or Bounty Hunter worlds. This change should prevent players from unloading their special attack and teleporting away for no risk. Players are also prevented from teleporting while their special attack bar is activated on these worlds. A typo in the Herb sack description was fixed. A floating tile in the Volcanic mine was removed. Cutscenes in the Rum Deal quest are no longer partially covered by the chat box on mobile. Runecrafting skill capes and max capes are now accepted as a substitute for Chaos tiara and talismans by the tunnel during What Lies Below. Brine Rats now have a chance of dropping medium clue scrolls. A typo in the Herblore skill guide was fixed. The examine text on Giant vials in the house on the hill was fixed. The recent restrictions on using Anglerfish and Energy Transfer have been applied to W45 DMM too.